On Saturday afternoon in Berkeley, UCLA showed that they have decidedly more talent than Cal. But more talent doesn’t always guarantee a win, as the Bruins’ 7-game, 16-year drought at Cal has proven. UCLA has been cursed up there, with a few of those 7 losses to really bad Bear teams. And this year, against a slightly better Bear team, the curse looked alive and well. UCLA turned the ball over 3 times (and also turned the ball over on downs once), leading to 20 Bear points, turning what could have been a Bruin blowout into a nail-biter. 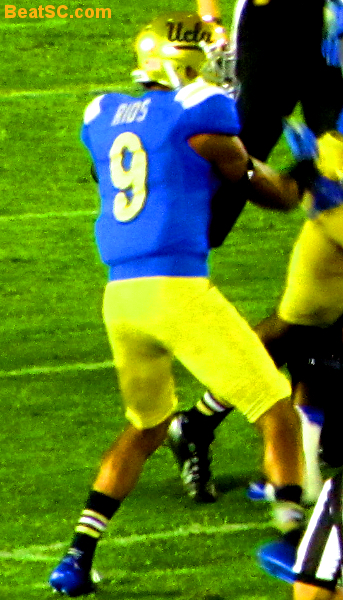 Brett Hundley threw for 330 yards and 2 TD’s (both to Running Back Paul Perkins) and ran 15 yards for another TD, as the UCLA Offense was gaining yards by the mile. But an Interception and 2 fumbles (1 lost) by Hundley and a lost fumble by Perkins kept the Bears afloat, despite the Bruins’ 567 total yards (200 more than Cal). A Hundley Screen Pass to Perkins for a 49-yard TD came at the end of the first half to make it 24-14 Bruins. UCLA came in 20-0 under Jim Mora when they led at the half, and that streak stayed alive… barely. The Bruins dominated due to their Offensive Line play, Offensive play calling. Defensive Line play, and Defensive play calling. The OL opened big holes for Perkins (who ran for 86 yards before coming out with a wrist injury), and gave Hundley more time to throw; O.C. Noel Mazzone called a TON of screen passes to Running Backs and Wide Receivers, including both of Perkins’ TD’s; The D-Line completely stuffed the Cal Running attack, and pressured the Cal QB all day, getting 3 Sacks; and D.C. Jeff Ulbrich dialed up a TON of blitzes, more than in the first 6 games combined… and it all worked. Owa Odighizuwa was especially huge, disrupting the Cal Offense all afternoon. Add that to the usual stellar performances of Myles Jack and Eric Kendricks, plus a impressive outing by Lineman Kenny Clark, and the Bears couldn’t score the 50+ points that they have come accustomed to tallying. On Offense, Jordon James added a tough TD run, and Wide Receiver Mossi Johnson had his best game ever, including a crucial 67-yard Kickoff Return. After the Bruins blew 10-point lead to fall behind 28-27, Hundley’s Rushing TD put them back on top 33-28. They misfired on the 2-pt. conversion, and allowed Cal to come back and score, making it 34-33, with under 7 minutes to go. Unfazed, Hundley drove the Bruins 55 yards into Field Goal range, and Ka’imi Fairbairn made it 36-34. The Bears had 3:40 left, and thanks to a dramatic 4th Down conversion, had the ball in striking distance, when — instead of just playing for a Field Goal — they took a shot at the end zone. That’s when Marcus Rios stepped up, and made a juggling Interception just before stepping out of bounds at the Bruin 1-yard line. Replays confirmed that he got control at the last split-second, and the game was iced. Obviously, the Bruins will have to play a little more mistake-free to pull off a “successful” season. After a game at Colorado next week where the Bruins will be huge favorites, they face Arizona, Washington, $c, and Stanford, where losing the Turnover battle would be fatal. These four teams will not MISS 30+ tackles like Cal seemed to. But with the improvement of UCLA’s Line play and play calling on both sides of the ball, there is still hope that UCLA can win any given game on any given day… as long as they aren’t givin’ the ball away. "¡RIOS MIO!" was published on October 18th, 2014 and is listed in Blue & Gold News.